Indispensable to any workbench for sawing and working on various materials. Made of quality hardwood with a deluxe clamp, made in Germany. Clamps easily to a bench or table edge up to 1 3/4" thick. This bench Pin is used in our FREE: Sawing Metal and Making Your Own Jump Rings online classes. This is a great tool to help you properly hold sheet metal to comfortably and precisely saw it. We also use it in our "Making Your Own Jump Rings" class to help hold the wire coil when sawing off the rings. Unscrew the clamp so the opening is big. Nice bench pin. Works very well, and clamps tightly. Love this bench pin, it really helps when sanding and shaping metals, just learning all the ways to use this pin. Sawing is my next project using this. Perfect for cutting metals. Fits snug to my table. This is perfect for sawing! 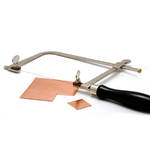 Great for helping guide the saw in cutting metal pieces. This bench pin was easy to set up and is terrific as I get into sawing metal. As my skills slowly progress, I've needed a bench pin for sawing metal & this one does the job perfectly. Easy to clamp to my table & use. Works perfectly.. can’t wait to really break it in.